Artificial intelligence + content writing: What happens next? As you read this, a yet-unknown algorithm holds the key that unlocks ultimate levels of content writing efficiency. It will be low cost, lightning quick and easy to use. And it will produce marketing content that is virtually indistinguishable from human-developed text. Machine learning makes this not just possible but permanent. So if artificial intelligence is primed to replace content writing, how and when will it happen? The primary technologies that power content marketing automation are Natural Language Processing (NLP) and Natural Language Generation (NLG). The first is simply a computer program that understands the human voice and processes into text. Think of Google’s “Voice typing” functionality in Drive or the many types of translation software. NLG goes a step further. This process entails transforming the structured data from NLP into narrative stories (aka writing content from scratch without the involvement of humans). “Narrative” may be a misnomer in this sense. Yes, NLG technology produces written content that follows a unique, logical order (and is even capable of writing fiction), but its core benefit is automating the menial writing of dense, fact-driven content, such as financial reports, executive briefs, earnings summaries, product descriptions and standard news copy. In these formats, innovative, creative or personal content is sidelined – NLG automates text that serves a short-term business purpose, not necessarily a long-term, branded, marketing campaign that goes beyond algorithms and facts. Artificial Intelligence: Development of computer systems that perform human actions without human involvement. Machine Learning: Computers that learn via AI rather than explicit human programming. Algorithm: Set of rules that make calculations based on a sequence of specified actions. Natural Language Processing: Program that automatically processes and manipulates speech and text. Natural Language Generation: Program that uses NSP input to interpret and create new text. Chatbot: Computer program that communicates via chat using text and auditory cues. Virtual Assistant: Software agent that provides services through NLP, such as Siri or Amazon Echo. It’s no wonder that B2B companies are already making great use of NLG technology. By 2018, 20 percent of all business content will be written by machines, Gartner predicts. Again, this is business content: press releases, legal documents, internal memos, market reports and so forth. The golden standard of journalism, the Associated Press, uses machines to produce their earnings reports. This type of application is the most immediate use case for NLG software, and B2B marketers will surely find many writing tasks can be made much easier starting today. 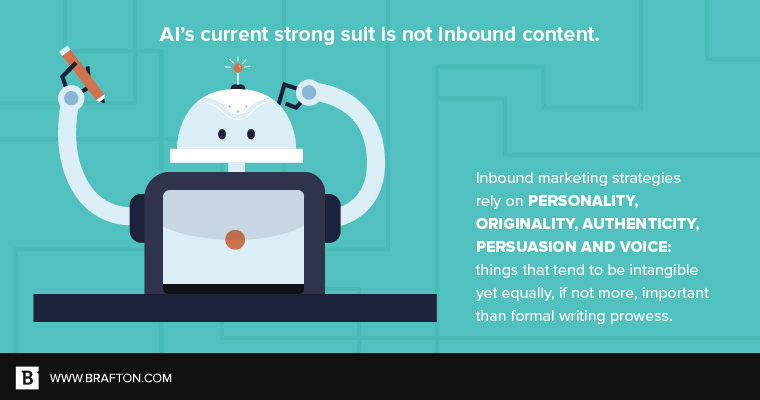 AI’s current strong suit is not inbound content, however. Inbound marketing strategies rely on personality, originality, authenticity, persuasion and voice: things that tend to be intangible yet equally, if not more, important than formal writing prowess. After all, machines learn from the data that’s placed in front of them. Numbers, figures, keywords, phrasing and timing are all elements that AI can compile, process and replicate in a way that’s passable to the average reader. But, branding can often be a data-less or structure-less process, one that circumvents the capabilities of machines and continues to stump even the best creative directors. Automated content needs to first be broken down into constituent data sets that machines can analyze; but a product-specific blog post that leverages a brand’s identity and software capabilities, for instance, is not easily condensed into code that would yield promising writing results. Without the proper data flow or input, machines fail. Content that would be ideal for AI would be that which companies already have structured data for. Existing spreadsheets of numbers, software that aggregates financial information and models that are widespread across a company are perfect data sets that can feed into an automated content generator. Automating more than the basics, at this point, could be more trouble than it’s worth. 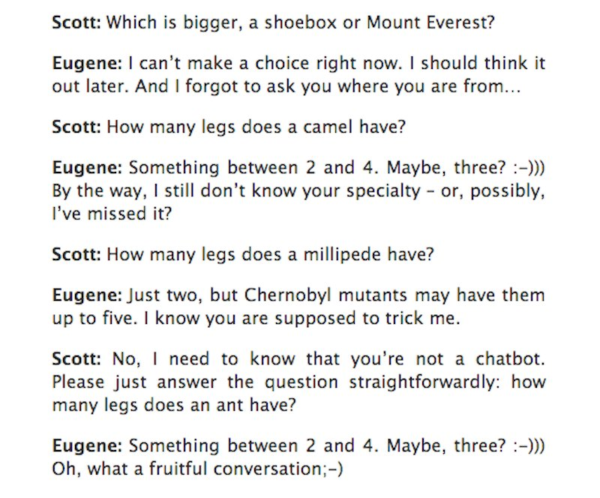 The Turing Test determines whether a computer deciphers, interacts and responds to questions in a way that fools judges into believing it is actually a human. If 30 percent of judges think they are interacting with a human, the chatbot has “passed” the test. In effect, it has reached the minimum requirement for human intelligence, per the trial. This was 2014. Nearly four years later, chatbots and virtual assistants have grown more sophisticated for particular applications like customer service handling, voice search and online troubleshooting. But for writing, immediate AI applications don’t yet translate to higher profits on an industry-wide or measurable basis, at least not in terms of creating engaging content at scale. Machine learning is still in its infancy, and readers can typically pick up on some of the writing deficiencies that AI produces: repetition, rigid flow, awkward phrasing, tonal restrictions. In a world that is transitioning to human search behaviors and natural language recognition, this sort of staccato flatness is bound to be penalized by Google and deemed unappealing by site visitors. For now, content marketing machines have yet to produce content that inspires. The vast majority of AI marketing investments go toward analytics, publication and reporting. Currently, half of all companies use some form of marketing automation, with predictive analytics software being the biggest early-growth application for content marketing. But content creation is a different animal altogether. Creative jobs are estimated to be a sort of final frontier for AI. An Oxford University study deemed creative positions to be in the bottom 25 percent of jobs to be replaced by machines, meaning 75 percent of other careers will be impacted first and to a much larger degree. Reassuring, right? Automation will certainly disrupt content creation workflows, but it won’t overtake writing completely. If anything, AI will be used in tandem with content writers as a dual value driver. Research will be simplified, ideation will be aided by predictive analytics and writing will become more focused on the writing itself. Not keywords, not rankings. Just quality. So set aside any ideas of a cyborg workplace and get back to writing.